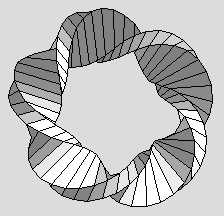 The generator (16kb) is a Windows program that creates a geometric description of a mobius strip and stores the information in the OFF file format. The program runs on my Windows/NT box which has Visual C++ 5.0 installed on it. The program has not been tested on other platforms. If you can not run the program, e-mail me and I will try to help as time permits. 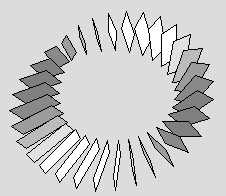 You can use Paul Flavin's 3-D viewer to examine the generated geometry, here is a sample. To use Paul's viewer with my generated .off files I had to copy his viewer and part of his web page my local drive. I placed my *.off files in the ...\java\java3dviewer\models sub-directory. You can also try to use Geomview or JGV available from the Geometry Center at the University of Minnesota. I have not used these programs nor tested my files with these programs. 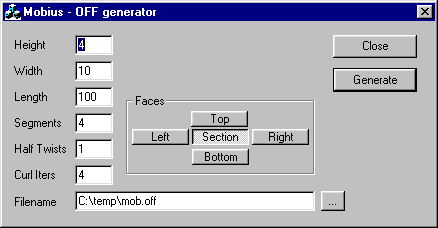 Somewhere in the future I hope to convert the generator to a java applet with a real-time preview as the parameters are changed. This page was last updated 18 September 2000.